Tomorrow, Wednesday, July 15, I’ll be the guest on Lynn Serafinn’s “Create-A-Life” radio show. Lynn is a personal transformation coach based in England, though her on-line radio show is heard everywhere. The interview will be at noon Central Daylight Time in the US, and at 6pm in England, where Lynn lives. Of course, as is the case with most Blog Talk Radio interviews, it will also be available for listening after the interview ends, but call-in Q&A will only occur during the actual broadcast. As an FYI for those of you who are in the UK, I’ve just learned from my publisher that the UK distributor, BookSurgeUK, will stop operating after July 30. So if you want the book, you might want to get it now. It will still be available in the UK after July 30, but will ship from the US, which nearly doubles the price. So if you’re considering buying, and you normally order books through AmazonUK, you have two weeks to save money. If you listened to the podcast of The Writing Show where I talked about nonfiction writing, you’ll know that one of my Five Rules is to edit ruthlessly. If you’ve been reading my blog for a while, you may also remember that in the May 2, 2007 post I mentioned that the hardest editing for me to do is getting rid of really “nice little stories” that have nothing to do with what I’m writing. I fall in love with moments or vignettes or images that derail the tale, but as much as I hate to get rid of them, I know they must go. HOWEVER, one of the happy things about this blog is getting to resurrect some of those axed passages—because I really did love the moments they reflect, even though they didn’t belong in the book. One day in Melbourne, while riding back to Sue’s place on the tram (streetcar), one such little vignette unfolded, and while I still have no doubt it had to come out, I’m pleased that I can share the excised passage with you now. On the tram there was the most adorable little boy—adorable not so much because of his appearance, but more because of his behavior. He was dressed in blue corduroy pants and a light blue shirt that was too big, but had the cuffs rolled up enough so the sleeves were the right length. In one hand he had his schoolbooks, in the other he clenched a $2 note to pay his tram fare. He could barely see over the conductor’s ticket table, so all you saw was tousled blond hair and blue eyes fringed with long, blond lashes. He said, “Excuse me,” twice to the conductor, who was busy trying to close up his books and change maker because his shift ended at the next stop. Because he was ignoring the little boy, I finally said, “Why don’t you just sit down—it doesn’t look like the man wants your money.” At this, the conductor looked up at me and blinked, looked down at the little boy (about 7 or 8 years old, I’d guess), then grinned and said, “Yeah, go ahead. You can sit down.” The little boy looked at me as if I’d performed magic, and came and sat next to me. He had a great quality of gentleness about him, and a smile that spread across his face like sunlight. At the next stop, a woman got on the tram with a baby in a stroller. The little boy watched the baby with the most beautiful and loving curiosity, looking up at me now and again to make certain I was sharing in this unspeakable delight. I was sorry when my stop was reached and I had to leave him behind. I wish I could let his mother know how wonderful I thought her son was. Last month, I joined Australian Pastry Chef Naomi Levine for a presentation given to the Culinary Historians of Chicago. Naomi talked about (and had samples of) several classic Australian sweets, then I rolled into a discussion of Australia in general and Australian food in particular. WBEZ, the local Public Radio Station, recorded our presentation. They just posted the podcast, and you can hear it here, if you fancy learning a bit more about Australian food. 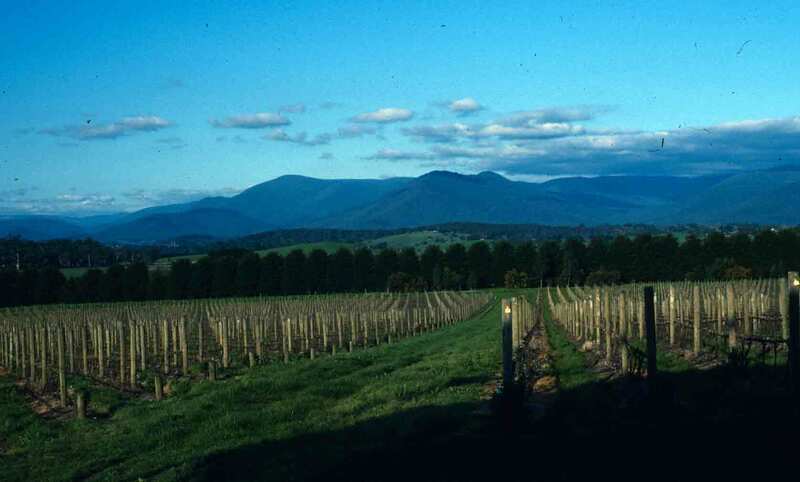 One image I mention that hasn’t appeared here yet is that of the view across the Chandon Vineyard, outside Melbourne—so here’s that picture. It’s quite a view. Goes well with a nice glass of champagne. I recently had the pleasure of being interviewed by Paula B. on “The Writing Show.” We talked about nonfiction writing, as I’ve not only done a great deal of it, but I’ve also taught it to a few people. If you’re interested in hearing a little about the world of publishing, my “Five Rules of Nonfiction Writing,” or horror stories from the front lines, you can visit “The Writing Show” and listen to the interview. The blog talk radio interview will take place next Tuesday, October 14, at 5 pm Central Daylight Time (United States). But the great thing about blog radio is that the interview just stays there as a podcast, so you don’t have to catch it when the interview takes place. Here’s the link to the site where the interview will take place and where the podcast will be “stored” afterwards. Cynthia’s book wasn’t at all what I expected when I first picked it up. I thought it would be a nice, light travelogue of some time she spent in Australia. Boy, was I surprised. First, this was no travelogue – it’s an intense love story between an American city-dweller and the vast continent of Australia. It starts with an infatuation from afar, and develops over the course of five months into a deep life-long love and respect. Along the way, we are close witnesses to Cynthia’s discovery of large cities, small towns, and hundreds of miles of outback. Each new experience is described in gorgeous detail from the joy of feeding flocks of wild parrots to the agony of sleeping on a bus. Each page is overflowing with adventures, and we get to meet each city, animal, plant, and person along with Cynthia as if we’re right there with her. “Waltzing Australia” is deeply emotional and personal. It’s an inspirational read about a strong woman living out the dream of a lifetime, and we are very fortunate that she decided to take us all along.